It’s a subject that comes up time and time again when I’m working with boat builders and boat yards, core close out; and I’m often met with a puzzled look when I ask about the procedure that’s used. For instance, I’ll ask, “How do you prevent water from entering the core material?” In too many cases the response goes something like this, “We use 5200 to seal everything up”. 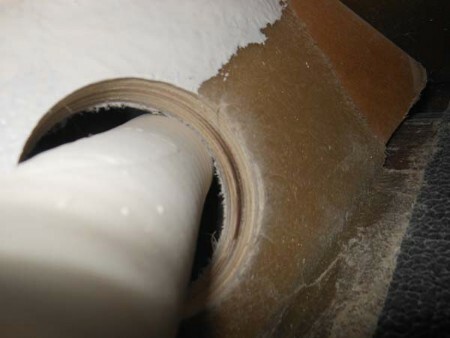 Core, the ‘core’ in ‘cored composite’, more commonly known as cored fiberglass, can be anything from simple plywood and balsa to exotic honeycomb or Styrene acrylonitrile and PVC foam. If water reaches this core it can wreak havoc, which is far more ruinous in the case of an organic material like timber, where it can rot. Water entry into the grain structure, or voids, in any core material can lead to freezing and expansion, and structural failure. Proper closeout technique never relies on something as fleeting as caulk, regardless of its makeup, polyurethane, polysulfide, silicone etc. ; all eventually degrade and fail. Instead, closeout should rely on a long-lasting material such as epoxy resin. Simply “painting” exposed core, like that shown here, with epoxy or fiberglass resin, while better than nothing, will not provide a durable enough coating to prevent water entry for years to come. In cases of plywood, which is again what’s used in this example, water entry is particularly destructive, as it travels via capillary action through the long grain structure. Core repairs are nearly always invasive and costly. Before drilling or cutting into any cored structures, or allowing anyone else to do so, make certain you understand what’s involved in properly closing out core. For closeout instructions and more on this subject see this article . You helped me a few times a few years ago with some questions I had. Here is one more. I have read your columns for a long time and don’t remember this being addressed. I was replacing the raw water impeller on the engines in my boat, and was concerned that even though I had the thru hull valve closed, I still got a trickle of water coming out of the pump. I thought it was possibly a bad valve. Then, when replacing the impeller on the other engine, it did the same thing. Hmmm. That’s not probable. So I had to remove the whole pump on the second engine, and traced the water to it coming from the engine and not from the intake. So, upon looking at all the hoses, the only place it can come from is the dripless shaft seal. So the question is, what is the proper way of plumbing the shaft seals? Mine are straight plumbed to the engine. Do I need a vacuum breaker? Is it appropriate to have a vacuum breaker on that line? Maybe a check valve? How else can I keep the water from coming back? You are to be commended for being curious about this water flow, it would be ignored by many. Depending on the location of your engine, and whether or not it’s at or below the waterline, you would have to take into account the possibility of siphoning or back-flooding (these are two different phenomenon, in the latter case it’s simply a function of every part of the system being below the waterline, no siphon occurs). The warning is clear enough, and I’m in complete agreement with the exception of the requirement for a check valve, where cross over plumbing is used, in twin engine applications. Check valves are great, when they work, however, there is no way to know when they are stuck in either the open or closed position, a not uncommon occurrence in seawater applications. My preference in this type of cross over installation utilizes 90° ball valves in the injection plumbing, where it is attached to the engine. A placard should be affixed nearby warning operators to close the valve if the vessel is operated with that engine not running, to prevent water from being pumped into its exhaust system, and possibly up and into the engine through open exhaust valves. I just wanted to start off by saying I’m a big fan of your articles. Here is my question. I just bought a new Catalina 385 with a the new Common Rail Yanmar FJH45. Since the boat is new I wanted to start using a Biocide in the fuel to prevent bugs. Yanmar said in there operating manual not to use them. I’m guessing because they have smaller injectors and higher pressure and they might clog. I could see an issue with older boats and fuel systems that aren’t well maintained. Please let me know your feelings on this. By the way, I reached out to Yanmar with no response. Thanks in advance. When it comes to diesel fuel treatment, biocides are truly a double edged sword. While they do kill biological growth, primarily bacteria and fungus, they can have a direct or indirect detrimental effect on fuel tanks and metallic fuel components. There are primarily two types of biocides, one water soluble and the other fuel soluble. Which begs several questions, which one should you use? How much water is present? How often should you treat, and what happens if you use a water soluble biocide and no water is present? Furthermore, if you shock a tank that has an active bio-colony, the die off creates a mass of “bodies” on the tank bottom. In the case of bacteria, which are animals, the carcasses include skeletons, which are abrasive. Furthermore bio-sludge can accumulate in this process, it’s often acidic, and retains water, and is harmful to metallic tanks, leading in some cases to corrosion and leaks. Therefore, using a biocide is a band aid approach of sorts, it’s treatment of the symptom rather than the cause. Biocides are only necessary of biological growth is present, and biological growth can only exist if water is present. Thus, the bigger problem is the water, and the ultimate solution is its removal. The preferred approach is to remove the water, the habitat in which biological organisms thrive. This can be accomplished using either drain or a stripper tube. I came across your article on transformers (http://www.passagemaker.com/channels/the-ins-and-outs-of-shorepower-transformers/) and was hopeful you could help me understand something regarding a sailboat I’m looking at, a 1997 Bavaria 46. A friend said I should ask if the boat has a single line or double line 220. The boat is currently in the Caribbean, and we’ll be bringing it to the states for the next few years. We talked about it for a while, but I’m not sure I’m clear on what I’m asking the boat’s current owner, and what it means. In Europe, and much of the remainder of the world, standard household and shore power is 230 volts AC, 50 Hz, while in North America we utilize 120/240 volts AC, 60 Hz. In the marine industry the two systems are often referred to simply as “50 Hz” and “60 Hz” boats. By “single or double line” I assume your friend was referring to these two systems. The North American 120/240 volt 60 Hz power scheme utilizes three current carrying wires, two hots and a neutral (and a non-current carrying safety ground), and is referred to as single or split phase, supplying both 120 and 240 volts. Voltage between either hot and the neutral is 120 volts, and between the two hots it is 240 volts. The neutral is grounded at the source, which aboard boats is the genset, inverter or isolation transformer, or at the dockside transformer. With few exceptions, under no circumstances should the neutral and ground be connected anywhere else aboard. For more on this see http://www.proboat.com/2011/10/demystifying-the-neutral-to-ground-connection/. There are ways around this, by using a transformer, which converts the onboard power back into something akin to what’s found in a 50 Hz environment. This doesn’t necessarily make the vessel safe or ABYC compliant in North America, it simply simulates its native power environment. The next problem is the pesky frequency, the 50 Hz vs. 60 Hz, which cannot be easily converted. Frequency sensitive gear includes anything that uses a motor, such as refrigeration and air-conditioning compressors, as well as pumps, as well as many electronic circuits found in appliances. Even if these are supplied with the proper voltage, if these are not designed to operate on 60 Hz, they may be damaged or their lives shortened, or they simply may not work at all. Motors designed to operate eon 50 Hz will run faster on 60 Hz, while motors designed to operate on 60 Hz, when used in a 50 Hz environment, will run slower, and often hotter. There are some tricks to get around this as well, however, such conversions are not the purview of amateurs, only experienced, ABYC Certified Marine Electricians should be tasked with such work. I have an Island Packet 29 and recently inspected the area behind the DC and AC circuit breaker panel (see attached photograph). I notice that the DC negative and DC ground bus bars and their ring terminals are heavily corroded, while the DC positive and AC bus bars have remained in good condition. I have searched the internet for the cause of this corrosion, but have not found a likely cause. Due to the selective nature of this corrosion (only DC negative and DC ground are affected), my own view is that this is caused by galvanic corrosion. Can this be the case, what is the cause, and how do I avoid this in the future, after replacing the affected parts? It’s tough to say why only the negative bus bars corroded, assuming the bus bars and ring terminals are made from the same material, i.e. copper, and they appear to be. Ideally, they and the ring terminals should have been tin-plated, which would have avoided much if not all of this corrosion. Galvanic corrosion requires the presence of two metals that are relatively far apart from each other on the galvanic scale, and the bus bars and terminals are not, both are copper or copper alloys. In this case I suspect this is a case of simple oxidative corrosion, copper, when exposed to air and moisture, oxidizes, producing verdigris, the green crust, which in and of itself is harmless unless it forms between connections. With the AC and DC panels de-energized, all terminals should be removed from the affected bus bars. They should be cleaned (consider replacing the bus bar with a high quality tinned unit) using ScotchBrite pad and electric contact cleaner, then reassembled using a conductant grease such as Thomas and Betts Kopr Shie.